I probably have too much fabric in my studio. I inherited some, some are leftover from client projects, but way too many of them were purchased in fits of optimism. When I was in college, one of my mentors sent me to an estate sale. "She who dies with the most fabric wins. And this woman was a winner." My studio may give this woman some competition. One of my goals for #the100daystitch is to only use fabric I already have. (I will allow myself to purchase thread, buttons, and zippers as necessary). So here I am playing with the fabric to figure out what I'm going to make next. For this project, I want to make an easy fitted dress out of cotton. I want to use my sloper to draft the pattern, and have a center back zipper for a straightforward construction. I'm feeling attracted to black and white fabric, as well as gingham. I find it really challenging to pick things to sew for myself. 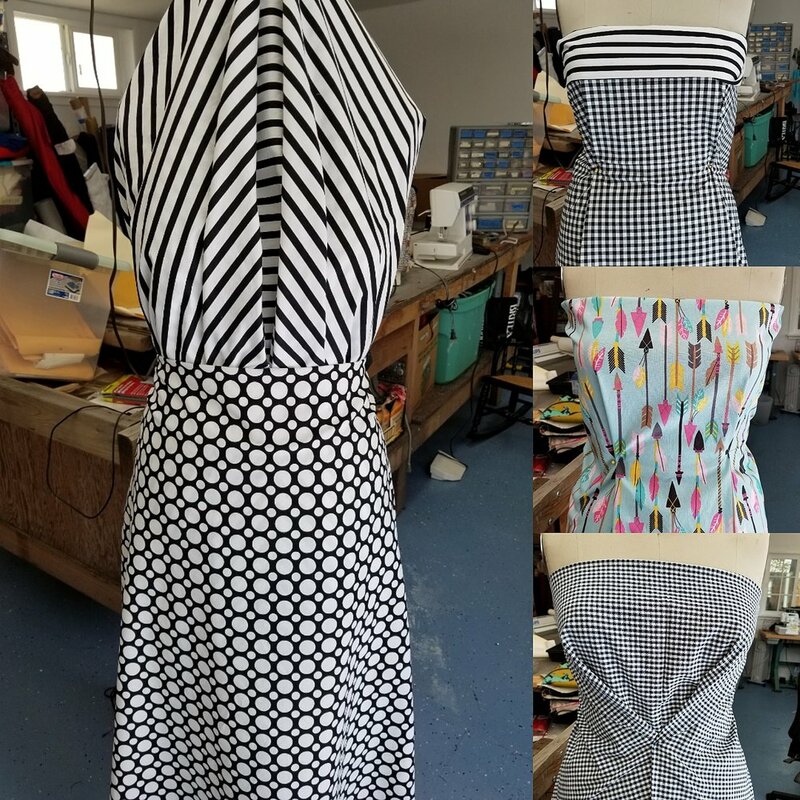 It is much easier for me when I'm working with a client with a sense of what they want, or if I'm sewing for a particular event with a hard deadline. As a creative person, I get really stuck when all things are possible, and I have no timeline. I'm enjoying sewing every day, because I can get out of feeling like sewing time is scarce, and into making a choice every day. It gets me out of my head, into into a flow. I ended up posting this picture to Instagram, and crowdsourcing which fabric to start with. I got the parameters that I was looking for, and people following along get to participate in what I make.